Falk Culinair's copper and stainless steel surfaces have been brushed to create a satinated surface as opposed to a mirror finish like other brands. What this does is reduce the work necessary to keep your cookware glowing like new. For general cleaning after cooking, washing by hand in warm soapy water is normally all you will need. For baked on food debris, soak in hot soapy water for an hour then wash as usual. That's all that's needed to lift away even stubborn cooked on foods. Copper will tarnish, which means that the atmosphere we breathe affects the electrons in the surface of the metal, causing a brown color to coat the exterior of the copper. This is referred to as patina and is actually prized and preferred by many professional chefs and cooking enthusiasts. To remove the patina, use a Scotch Brite pad or similar scrubbing pad, along with a cleaning paste intended for copper, to restore the bright copper colour. This darkening of the copper on your cookware or other copper household items does not mean the copper is wearing off or that anything at all is wrong. It does not affect the cooking experience or performance of the cookware and should be considered an aesthetic preference only. This oxidation is a natural phenomenon due to the way carbon dioxide in the air interacts with the metal. Your Falk Culinair cookware is designed and crafted to last a lifetime, and by observing a few practical care procedures, it will remain in as-new condition indefinitely. Never submerge your beautiful copper cookware in water for extended periods of time. The cast iron handle will rust if left to soak in water and the copper will become tarnished. Instead, pour hot water into the vessel and add some washing up liquid. Let this soak inside of the cookware while you enjoy your meal and the clean up should be simple when the meal is done. Avoid pitting and marking the stainless steel interior by stirring in salt, don't let it sink to the bottom. Add to boiling or simmering and stir till dissolved. Use the best tools for the job. We recommend the use of wooden or plastic utensils as sharp metal utensils can mark your cookware. Use hot water inside of your hot cookware when cleaning, as cold water in a hot vessel can cause metal to warp. Match your pot or pan to the right hob ring, especially on gas hobs. The flames can lick the sides of your vessel during cooking if you put it on a hob ring which is too large. This causes marks as well as overheating the vessel. And remember, copper conducts heat more efficiently than other metals, it's important to use slightly lower heat settings than normal. This will avoid unnecessary scorching and reduce the clean up work involved. Keep an eye on simmering liquids and foods- Never allow the fluid to boil dry. This is the quickest way to damage all cookware. Not to mention ruining a decent meal! You needn't be a chemist to know your basic chemistry. Never use harsh chemicals or chlorine based products to clean your copper. 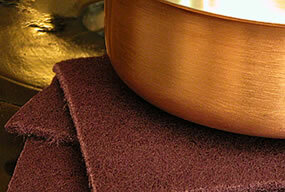 Use washing up liquid and when desired, a polish intended for copper for best results. Wire wool and other metal-based scrubbers are not suitable for cleaning your beautiful copper cookware as these can etch the brushed texture of the stainless steel and copper. A rigid plastic scraper can be useful in removing stubborn food debris like scrambled eggs, then follow up with a Scotch Brite, or similar scrubbing sponge. After washing and drying, a periodic polish with olive oil on the cast iron handle will keep it looking great. Always dry your cookware thoroughly after cleaning. Also, the dishwasher is not suitable for copper of any kind as the detergents and salts will tarnish, etch and corrode the copper.